Retail stores in France and Germany are selling the DVD re-release of “Live” two days early. The Fnac store in Toulouse is confirmed to be selling the DVD. Other Fnac chain stores are likely stocking the DVD. Because of delays in Mexico, France is the first region to have the DVD in stores. The bonus “photo gallery” only carries screenshots from the DVD and the jukebox only allows you to play audio from the concert. Check below for scans of the packaging and menu screen captures. Thanks to Thomas for the news and scans. Dolores O’Riordan appeared this week in several episodes of VH1’s “I Love the 90s Part Deux.” She appears in the 1990 episode talking about the Rugrats cartoon and in the 1991 episode talking about MTV Unplugged, among others. VH1 cuts up celebrity interview clips and distributes them throughout every episode in the series, so we’ll see more of Dolores in the upcoming episodes, which debut every night this week. We will update this news page with her other appearences in the series, stay tuned…..
Don’t forget that there will be a special segment on The Cranberries’ “Zombie” in the 1994 episode which premieres Wednesday night at 10 PM EST. For the rest of the episodes, check the VH1 Schedule. Other celebrities comment on how ugly the Rugrats babies are. Dolores pipes in that they have “massive heads, completely… BLAH!” When she says “BLAH,” VH1 uses an effect to stretch Dolores’s head to double its normal size. Dolores sings a line of Radiohead’s “Creep”: “I don’t belong here.” She then adds, “But we’re all creeps really, aren’t we?” Later, she announces the title of the movie Leprichaun and narrates that the leprichauns are are all “obsessed with money, money, money, money… uwaa!” while making her scariest possible face. “I kind of was a little bit of a fan when they came out. She was kind of cute,” says Lit’s guitarist Jeremy Popoff. “There’s something about those Irish female singers that just…. I’m going to say ‘raises my cockles,’ but I think you know what I’m saying when I say ‘cockles,'” jokes comedian Michael Ian Black. Dolores sings a line of Alanis Morisette’s “Thank You”: “Thank you silence.” In a segment about rave music, VH1 samples Dolores saying “boom” and makes a quick all-vocal dance beat (eerily similar to Björk’s new single “Triumph of a Heart.”). She then says, “I think you have to take something to get this music” with a knowing grin. Thanks to several ZG’ers for the tip! New York-based synthpop band Elkland is gearing up to release their first single, “Apart,” on February 1 on Columbia Records. The single contains a cover of The Cranberries’ “Salvation” as a B-side, though we can probably expect something more electronic than punk. 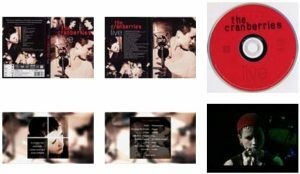 Universal released The Cranberries’ “Live” on DVD today in Mexico. Mexico is the first region in the world to get the DVD. Online Mexico-based retailer Mixup has the DVD available to purchase on their website for $189.00 pesos MX (~$16.85 US). Unfortunately UNIVERSAL MUSIC MEXICO had an important delay in the distribution of this edition. With all and the compromise that they had with is for this DVD’s delivery, this one will be after the date told, by the moment we still don’t have the new distribution date but in the moment we have more news we will tell you. That’s why we apoligize with you, because the delay in distribution is out of MixUp’s control. Zombieguide will have a full report on the contents of the final DVD once some fans get their hands on it! “Live” will release on January 24 in Europe, February 2 in Japan, February 8 in the US, and February 9 in Canada. As has become the standard with VH1’s “I Love the…” series, we can expect other artists and celebrities to chime in with their memories of the song and any special stories they have about it — and probably some making fun of Dolores’s characteristic vocal tics as well. You can catch the 1994 episode of “I Love the 90s Part Deux” when it debuts on Wednesday, January 19, at 9:00 PM EST in the US. It will also repeat several times, so check the schedule for more dates. If you miss it, Zombieguide will cover it as soon as it airs, including a video capture. Thanks to imnotblind for the tip! Today’s Sunday Mirror published an exclusive scoop that organizers in Ireland are putting together two massive concerts to benefit Asian tsunami victims, and that members of The Cranberries may be asked to perform. While most of the details are still not finalized, the massive benefit concert will be split between a Republic-sponsored Dublin concert and a UK- sponsored Belfast concert. Organizers would ideally like to see U2 headline the benefit concert. A host of other A-list artists to be invited to perform include Westlife, Brian Kennedy, Girls Aloud, The Corrs, Enya, Van Morrison, Daniel O’Donnell, The Undertones, Ash, Samantha Mumba, The Thrills, Christie Moore, Ronan Keating, and The Cranberries. Also invited are Irish- rooted acts Lisa Stansfield, Joe Elliott and Ron Wood of the Rolling Stones. The article states that only a few artists have been contacted thus far, but that the interest has been “very, very positive.” If the Cranberries accept, they will play in Dublin. No date has been announced, but this would be pivitol, as Dolores is due to give birth in March. The Irish government has already pledged 10 million Euro while the UK has pledged £50 million to sponsor such a gig, though the proceeds raised are expected to be much greater. Further details on concert venues are expected to be decided by next week.